Italian trumpeter Enrico Rava doing a tribute to the late King of Pop, Michael Jackson? 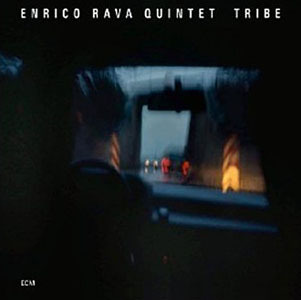 Italian trumpeter Enrico Rava doing a tribute to the late King of Pop, Michael Jackson, on ECM? If either of these concepts seem somehow wrong, it's likely because, in forty-plus years, ECM has garnered (beyond its reputation as one of the most important labels in the history of music) its share of magical (and incorrect) thinking. Rava, it turns, out, hadn't paid much attention to Jackson until the pop star passed away in 2009. Soon after, finding his wife watching a Jackson concert DVD, Rava quickly became a convert, even as he learned of the entertainer's ..."absolute authority on stage, in control of every small detail, correcting a spotlight, the emphasis of a bass note, a dancer's step, or the length of a musical pause." 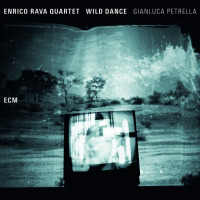 Recorded live, the audacious, bodacious and perspicacious Rava on the Dance Floor might seem like an anomaly in the ECM catalog, but it succeeds in getting to the nub of what Jackson's music was about, demonstrating that, for Rava, good music is where you find it, rejecting elitist thinking that pooh-poohs musical popularity and commercial appeal. With musical arrangements by trombonist/tubaist Mauro Ottolini, Rava and the 11-piece Parco della Musica Jazz Lab (PdMJL) rock out ("Privacy," "Smooth Criminal"), swing gently ("Smile," "Little Susie"), move effortlessly from free play to tuba-driven dervish to flat-out reggae ("They Don't Care About Us") and get righteously funky in a very up-tempo way ("Blood on the Dance Floor"). With guitarist Marcello Giannini's copious overdrive, the music can be gritty at times, and PdMJL's unrelenting rhythm section ensures that it grooves hard. 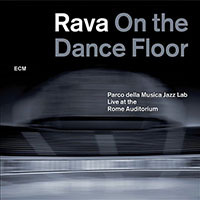 But Rava on the Dance Floor ultimately reveals itself as more than just a big band treatment of material associated with or written/co-written by Jackson. An iconic tune like the title track to Jackson's megahit Thriller (Epic, 1982) is both familiar and reinvented: familiar, because all the key melodic components are here; reinvented, because this large ensemble isn't afraid to open up and travel to uncharted (figuratively and literally) territory. The arrangements are rigorous, but this isn't just a case of structured charts with planned space for soloists, though there is plenty of thatbeyond Rava's consistently lyrical yet searching performances throughout, including an impressive alto turn from Daniele Tittarelli on the balladic "Speechless," a powerhouse tenor feature for Dan Kinzelman near the end of "They Don't Care About Us," and Ottolini delivering some visceral trombone work that dissolves into utter free play at the end of "Thriller," before cueing to a brief but muscular reiteration of its main theme. Instead, while there are, indeed, clear roadmaps to these nine arrangements, there's also room for the entire band to engage in sheer spontaneity...and a little humor thrown in, here and there, for good measure. Given Jackson's attention to detail, a tribute album that allows for such absolute unpredictability might have been anathematic. But with Rava on the Dance Floor, the trumpeter and Parco della Musica Jazz Lab manage to retain unmistakable reverence for Jackson's music, even as they take it to places the King of Pop could never have envisaged. Track Listing: Speechless; They Don't Care About Us; Thriller; Privacy; Smile; I Just Can't Stop Loving You/Smooth Criminal; Little Susie; Blood on the Dance Floor; History. Personnel: Enrico Rava: trumpet: Andrea Tofanelli: trumpet, flugelhorn; Claudio Corvini: trumpet, flugelhorn; Mauro Ottolini: trombone, tuba; Daniele Tittarelli: alto saxophone, flute; Dan Kinzelman: tenor saxophone, clarinets; Franz Bazzani: keyboard; Giovanni Guidi: piano, Fender Rhodes, toy piano; Dario Deidda: bass; Mercello Gianni: electric guitar; Zena de Rossi: drums; Ernesto Lopez Maturell: percussion.